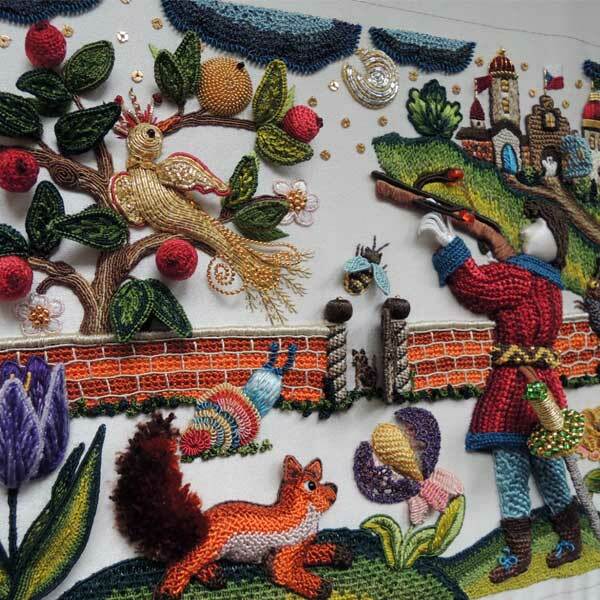 Oh, that Needlework Bucket List! Please tell me I’m not the only one who has a Bucket List when it comes to embroidery projects! A Bucket List is a list of accomplishments or experiences that we want to eventually achieve. Often, these are events, projects, plans that we consider luxuries right now, that we work towards as life progresses. I probably don’t have to tell you that Bucket List items often are not achieved. We think about them a lot, we dream about them often, we pine for them and plan for them – but it isn’t unusual that they don’t happen. Life takes us down one course, then another, and before we know it, the opportunity to experience this or that on our Bucket List is gone forever. Lately, Tricia has been highlighting the accomplishments of course participants over on Thistle Threads. 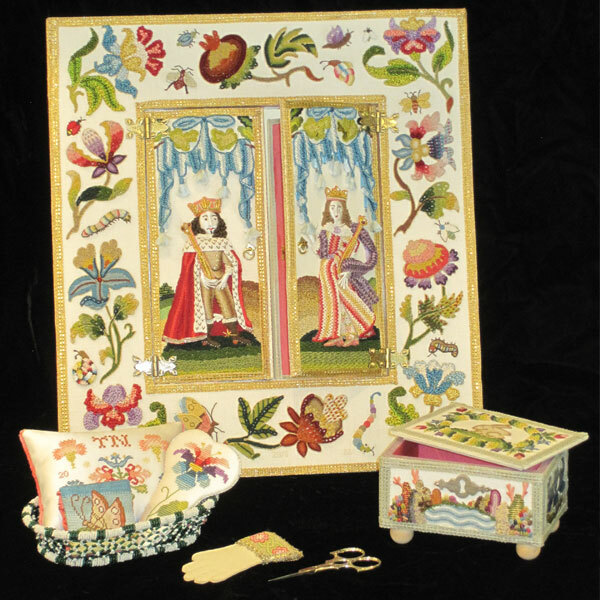 If you haven’t seen the details of Jeri Zoubek’s stumpwork box, pictured above, depicting scenes from a Czechoslovakian fairy tale, do take some time to go see it on Thistle Threads! 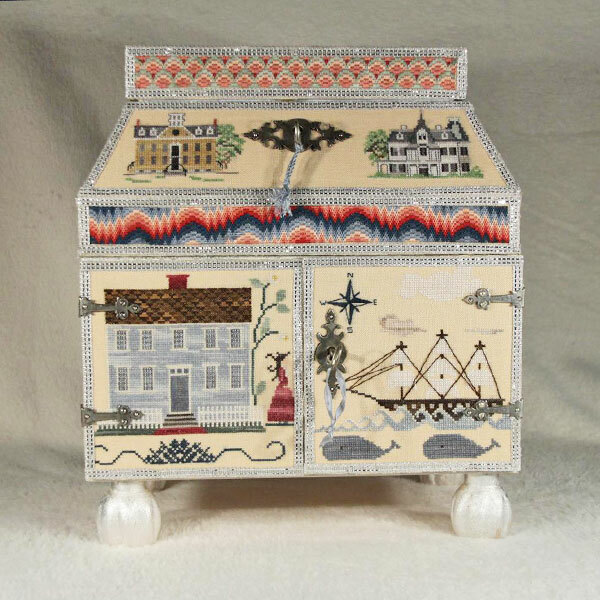 The Cabinet of Curiosities online courses at Thistle Threads focus on the creating of your very own embroidered casket or box, based on historic 17th Century embroidered caskets, but made new by your own interpretation. Why are these classes special? 1. They are highly researched and deep. They plunge you into the history of the embroidered boxes of the 17th century, sharing details of extant boxes that, chances are, you’ll never have the opportunity to experience anywhere else. The participants have access to licensed museum images by the boatload! They also have access to Tricia’s in-depth research, historical information, and instruction focused on this small period of embroidery history. 2. The courses involve materials the likes of which the needlework market hasn’t seen in hundreds of years, from recreated color lines of specialty silk threads to custom-made replicas of historically accurate hardware and finishing materials. 3. The items and the boxes created, while they may (or may not – it’s the participant’s choice) employ 17th century techniques, are not strict re-creations. Each box is unique to the maker, and tells the maker’s own story. 4. The courses have an active community of enthusiasts involved in them, who share ideas and help each other to create their own masterpiece boxes. Here’s another box highlighted on Thistle Threads recently, by Kate & Jack Hewitt, called Wiscasset Memories. The box highlights, in counted techniques, well-known New England historical houses and the coastal life of New England. Tricia recently announced on her website and in her newsletter that, after the current Cabinet of Curiosities courses are filled, there’s going to be a pause in the offering of the classes. You can read the announcement here, in this article on the stumpwork mirror, which is offered as an extra project in the second part of the Cabinet of Curiosities course (the Stumpwork segment). Besides the need to reevaluate and renew licensing for the hundreds of historical images used throughout the course, the pause is necessary to reevaluate the future availability of supplies for the classes. Because so many of the materials are created on a small scale by skilled artisans and craftsmen, it makes sense that the courses can’t be offered perpetually. The supply chain just doesn’t work that way. So, to ensure that there are supplies for all the current participants, there has to be a pause to consider whether or not the supply chain can and will remain intact. I’ve heard from so many of you over the years, telling me that your Big Dream is to take these classes, that you plan to take them in the future. If you’ve had these courses on your Bucket List (and you’re certain that you want to take them), don’t put them off. While we definitely enjoy an “embarrassment of riches” when it comes to the amazing range of needlework supplies and classes available today, they aren’t guaranteed to last forever. I don’t want you to be disappointed, in case the opportunity doesn’t arise again. You can find all the information about the currently enrolling classes here. They start this Fall, and they last 18 months. You can take either or both parts of the course, separately or concurrently, and you can work through them at your own pace. If it’s your dream, I hope you get in on the classes! This is not a paid endorsement or advertisement – it is just news that I thought you should know about, in case you hadn’t heard. Good luck, Sarah! Let us know how it goes! I did see that a new class was going ahead in the Autumn for the Cabinets of Curiosities which would be a great course to be involved in, but for me it’s the cost of the course which is out of my budget range. I realise the course is well worth the money because of the shared detail of historical and a very in-depth instructional based course. As well as the huge speciality materials that participants receive and the online community that is available all these make for a great and well worth course to be involved in. Thanks for sharing the news of this wonderful course and for the links to the lovely pieces of the Cabinets of Curiosities. WOW. I had not heard of this before and…it’s just a stunning opportunity that is far out of both my budget and my league. I’m not anywhere near good enough to be able to do that kind of work. I would love to be someday! What a fantastic class. I am quite sure that it’s worth every penny. The only things keeping me from throwing myself bodily into these projects are, sadly – time and money. Life would be much more fun if we all had more of both of those things. So fun to see Jeri’s work! I taught her a few years ago at the RSN San Francisco. She is such a telented stitcher and a really fun person to be with! Thank you for sharing her work with us. Can you recommend online courses for beginners?? I have just recently started embroidering and am looking for a class and/or a teacher. Thank you so much! I love your tutorials, videos, and tips, by the way…they’re extremely helpful!! When I went out to get the mail a couple of hours ago, I received three needlepoint patterns. One, I saw, was part of a series; I want a few more of them. I already have more patterns than I can get to in this lifetime. Why did I order more? Because I like to look at them, and I might actually do them. My one wish has been to attend the classes in Williamsburg some year; now I’m not sure my healath will let me travel alone. Oh, now I am torn! I recently started a new job which gives me enough extra cash to do something like this (though not necessarily the time). I had been thinking of doing an online textiles degree through the OCA, but now I’m wondering if I should put that off to take this course while there’s still the chance. On the one hand, historical accuracy in stitching isn’t really my thing, but on the other hand the techniques and the materials look so amazing, and I could work on my own contemporary designs. I think I’d better sleep on it! I, like many others have a vast ‘bucket list’ this being one of them. The cost has always been an issue for me, the exchange rate – another factor. USD%1199 = $1600AUD). I think timing is everything and oddly today my in-box had 2 emails (yours and another regular), I read yours first clicked on the links an dreamed, then I read the other – the topic “permission”,it resonated with me. I’m inspired to get creating again so I can learn more and tick one more item off my bucket list. No one has mentioned seeing elaborate stumpwork featured in episode 103 of the BBC America tv Jonathan Strange and Mr Norell series. Lady Pole starts the fabric collage wrapped figures in #102 and the magician villain set to destroy it in #103. Costuming is echoed throughout. Budget is a biggie. I would love to do one of these & like the fact you can pay monthly. I will definitely be keeping an eye on their website. Living in NZ makes things a lot more expensive, but that can add to the value. Getting all those threads is a huge bonus – often supplies are the hardest thing in a small country. Now you’ve done it! I paid my deposit on the first class. Oddly enough, I’m not hyperventilating over the cost–I had looked at the TT site and drooled over this class in the past, so I went for it! I’m consoling myself by remembering that rather than buying shoes or makeup from big corporations, I’m spending my money to support women’s businesses, both on TT and the many Etsy shops I buy from. What a great excuse, right?? Previous Previous post: Gingham Embroidery Tutorial: Watermelon!